Especially useful where site restrictions mean that it is not possible to fit a standard configuration one or two piece tank into the available space or to pass it through doorways or similar restrictions on site. If you can provide the available space dimensions and state the capacity that is required, we will calculate the tank configuration we feel is most suitable for the application. In addition, we manufacture tanks of all sizes and configurations: long, short, tall, low, wide and narrow. You name it, over the years we have probably manufactured it. Bespoke tanks are only slightly more expensive than a standard tank of similar capacity but will certainly provide a cost saving compared to sectional tanks. 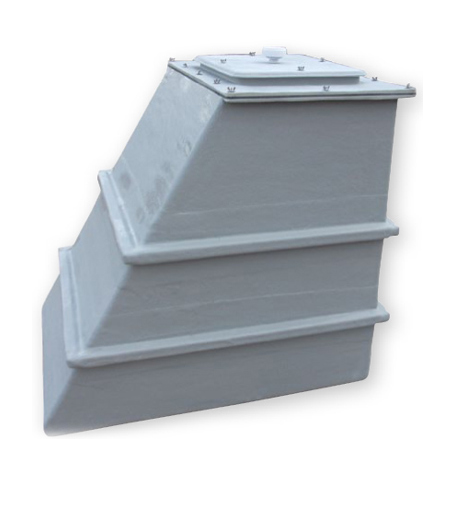 Additionally, bespoke tanks are available as One piece and Two piece, and can also be fitted with internal divisions, raised float valve housings and all of the other connections and ancillaries that are available. Purewater bespoke tanks are manufactured from WRAS approved Grp materials and to BS EN 13280:2001. They are designed to store potable water up to a maximum temperature of 29ºC. We can also manufacture tanks to store water at higher temperatures and to store chemicals. All tanks are supplied as standard with 25mm insulation, we can also supply either un-insulated or with 50mm insulation. Generally available with a capacity range normally no greater than 16,000 litres. Please contact our sales office with your requirements.